~Bunny Lane Designs~: It's Giveaway Time! I was approached by Leslie of Mamma Tortilla to participate in their first giveaway and create "something cute". So many things fall in my "cute" list, but the very first thing that came to my mind was to make a little doll perfect for a little girl that included a change of outfits along with a matching baby quilt. 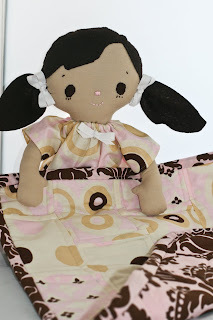 Now the doll being pictured has dark brown hair and dark brown eyes, but no worries, I've offered to create a personalized little cutie for the special little girl in your life if you are the winner---granted your little one does not have Dark Brown or Dark Brown eyes, so this is a giveaway for everyone! Spring will be here before you know it and that along with Summer are my 2 favorite seasons, why? I love getting my girls dressed up like little princesses. 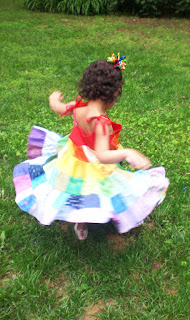 To help one lucky reader of my blog get an early start for the warm season, I am offering my patchwork twirl dress handmade by me for your daughter, grand-daughter, neice, sister, cousin whomever you choose to have this dress made for plus a matching hair bow. This one's my daughters, she won't part with it, but I will happily re-create one for the winner. Look at the twirl and just imagine the wonderful photos you will have not to mention one happy little girl. How do you enter? Leave me a comment here and tell me why you would want to win this dress. It's that easy. Spread the word and follow my blog, as there will be more giveaways and tutorials here! A winner will be chosen and announced on Monday! Good Luck! That dress is absolutely adorable. My daughter will love it! And we won't have to wait for warmer weather since we live in Honolulu - she will get to wear it year-round (and probably would not part with it like your daughter) like she does her Hawaiian dresses. This would be to cute for my niece! She loves wearing dresses! My daughter would be so jealous! I love this dress!!! I have always admired it from HG and believe me I could absolutely vision this adorable dress on my 2 year old daughter twirling and twirling. Love your creations Abbie! Just beautiful! Hi! I'm Shanna (babyeliza) from HG and I LOVE that dress! I love it in your avatar too! My daughter loves dresses and I would rather put her in something handmade than store-bought any day! Especially in those colors! Aside from the fact that it's outrageously gorgeous, I want to win that dress so my daughter can have her own bit of sunshine to surround her. ps. i would love one for me!! The dress is bright and beautiful and my daughter would LOVE it! She is 3 and I can just see her twirling around in it! My six year old niece would love this dress, she is definately a girly girl - I have a boy the same age as her, they are on a bowling team together, we have to talk her out of wearing her dresses when she bowls. Thank you for the contest. HI Abbie, I am from HG...love that dress. I think I should win because today is my baby's 2nd birthday! This dress will be a perfect bday gift for sure! And oh ya I am deathly afraid of a sewing machine, so I will never be able to make her one of these fabulous dresses ever! Thanks! This is so beautiful! 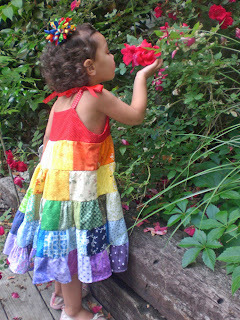 My mother used to quilt and smock and she would absolutely adore this dress on her grandbaby! My daughter will be 2 in June and this would be the perfect gift! Wow. In this trying economy, what a wonderful gesture for you to give away a free dress!! This dress is ADORABLE! I LOVE, LOVE, LOVE patchwork. I cannot sew a straight line, so I appreciate all the work put into patchwork designs. Boutique clothing is just awesome. I love when girls are able to have clothes that aren't mass produced and that give them a chance to have something that is original. I have two girls. A 10yo and a 10m old (yes, you read that right! The Lord decided our family wasn't done). I would be ecstatic to have either of my girls in this dress. My hopes are that you would choose my comment, but to be honest, your choice will be a blessing for whomever may receive it. Thank you for your kind heart. That dress is adorable! My 6 yr old would look beautiful and sassy wearing it!! I would love to win this adorable little dress because my 2 year old grandaughter would think she was the most beautiful princess, wearing this dress! I would absolutely love to win the doll or the dress for my daughter! She would love them to pieces!! Thank you for the chance! You make beautiful things!! I came over from Swap Mamas because you said my favorite word...giveaways! I am now following you because you have an awesome blog. I would love to win this dress for my niece. my little daughter would love the doll or the dress. she is 2 and loves dolls, and I would love to win the doll so i could here her scream dolly. Great work and nice blog. Saw you on swapmamas. Keep up the great work. Wow wouldn't I want to win that dress? Its Awesome in so many ways. My daughter would love the color and the twirliness. She was in the little of Macy's twirling her skirt in front of the mirror the other day. It was adorable. Your daughter is so cute... and that dress... Oh my... cute, cute! Thanks for the giveaway. That little dress is beautiful!! I love the colors!! Would love to have this for my new little granddaughter! What a beautiful dress!! I would love to win it since I am having a baby girl in a couple of months, and would love something so beautiful for her. Thanks for sharing! came over from swap mamas. thanks for the giveaways!! i want the dress, but sine it won't fit me i will let my youngin' have it if we win:)! Hi. My name is Angelina and my mommy's name is Andrea. We think that the dress is absolutely gorgeous. 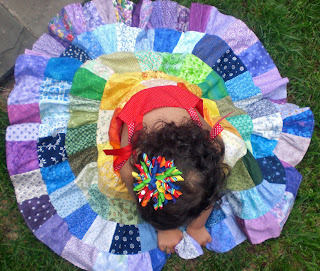 It is so beautiful how you can see that your little one is twirling and still see the patchwork on the dress! I will be 1 on February 16 and while Mommy is trying very very very hard to learn how to sew, she is just not very good at it. I'd love to have a handmade dress before I hit college. My little girl was sitting next to me as I read your blog and said, oh mommy who is that girl, she looks like a princess! She loved the dress!!! Her best friend passed away last week and I think this is the first time I have heard her giggle since. So that made me a winner already! I would love this dress for my little girl--the dress is so amazing and stunning that I would be so proud to have her wear it. I love how unique it is and georgeous. This dress would make my daughter a true princess...you have amazing talent! i am so in love with these items you are giving away. The dress is absolutely adorable. I would love to have it for my 3 year old red headed granddaughter. She loves to twirl around one way and then the other. She always asks when she's done, "Mama, why is the floor moving?". Her name is Lucy to go along with the beautiful strawberry blonde red hair. Rita or better known as Rae Rae to my grand children. My daughter would LOVE to twirl!! :) This dress is perfect. I just learned of your blog. Can't wait to follow. My little 3 year old g'daughter will only wear "beautiful dresses". I will put your contest on my blog tonite! I'd love to win that for my grand daughter Elizabeth. Her mother is a professional photographer and she would take colorful pictures of her in that beautiful dress. What a beautiful dress and I have a little Grandie who would just love to twirl like a princess. Wow. Those photos are jaw-drop gorgeous. Of course your princess helps the cute factor of it all. I'm impressed at the work of this. I sew and I can appreciate the time that goes into this. I love all things handmade and this dress would be a cherished heirloom in our family...one of the pieces we will keep for my own grandchildren. I've seen skirts that twirl like that but haven't seen a dress....wonderful! I was a 'spinner' when I was little and my granddaughter is too. We'd love this cute summer time dress! Wow, beautiful multi-coloured dress! My two girls will be all over it! Enter me in the contest.